The Deluxe Front Windshield fits your Grizzly 700. This Yamaha ATV windshield is a great way to protect yourself from the elements when your out in cold weather or driving down a gravel road in the rain. It offers handlebar coverage for warm hands, a covered compartment and beverage rest. Installs in just 15 to 20 minutes and is made from ultra durable plastic for high performance in the outdoors. Shown here in blue, also available is a green windshield and red windshield. 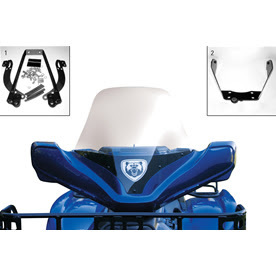 Click here to browse for more ATV accessories. See ATV windshields for other models such as Kodiak, Bruin, Blaster, Raptor, Banshee and Wolverine .